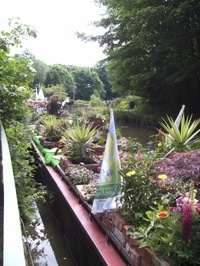 The British Waterways heritage boat 'Lindsay' was launched in spectacular style from Bollington on Sunday as part of Bollington's Floral Weekend. A fun packed weekend with open gardens, morris dancers, brass bands, a children's pet show, plant sale, bouncy castle and much more. Lindsay was waved off in style at 3pm on Sunday to Rod Stewarts 'Sailing'. 'Lindsay' then stopped of at the Queens Head Hotel in Congleton for an evening of entertainment with local folk band 'Lost in the Mist'. 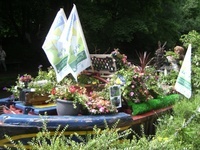 Many people went down to take a look at the beautifully decorated boat and to sample the many real ales that the Queens Head has to offer. 'Lindsay' is currently on her way to Rode Heath and will arrive today (Wednesday 11th June) at 2pm to be greeted by local school children. This will begin an afternoon/evening of entertainment with the local school band, Rode Hall Silver Band, the Church Choir and much more. 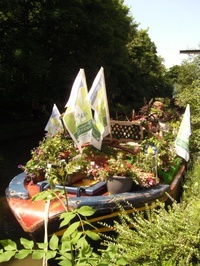 The boat will moor up outside the Broughton Arms pub and the entertainment will commence on Rode Heath Rise.